A stencil spray painting by secretive artist Banksy shredded itself after it was sold in Sotheby's auction house here for more than 1 million pounds. 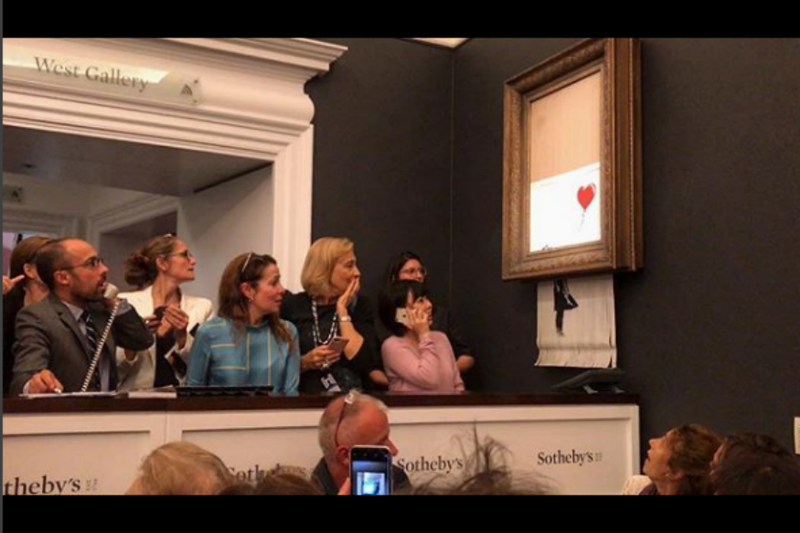 "Girl With Balloon", one of Banksy's most widely recognised works, shows a girl reaching towards a heart-shaped balloon and was the final work sold at the auction on Friday night, the BBC reported. "Girl With Balloon", one of Banksy's most widely recognised works was sold at the auction, which suddenly passed through a shredder installed in the frame. Banksy is a Bristol-born artist whose true identity, despite rampant speculation, has never been officially revealed. "Girl With Balloon" originally appeared on a wall in Great Eastern Street, London. In 2017 it was voted the nation's favourite artwork. The gallery version featured spray paint and acrylic on canvas, mounted on a board.